Metro Seismic Preapproved Bolt Plate Kits are available for 1-5/8" (41mm) diameter post assemblies that are compatible with HD Super and MetroMax Q Series only. This 1/2" (12.7mm) plate (50BP Series) is rated for 50 lbs. psf. 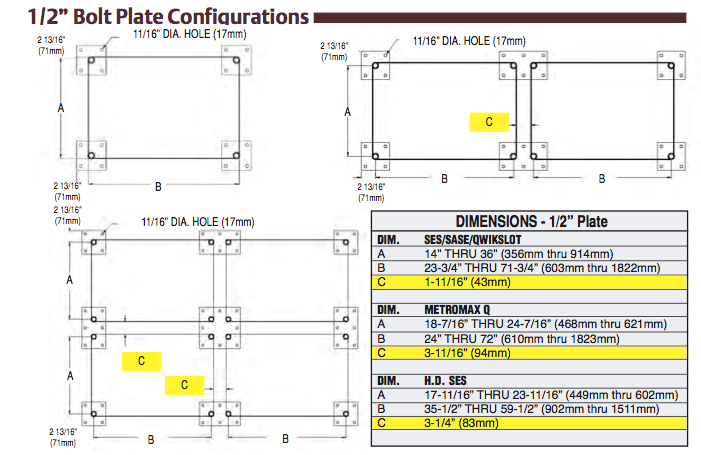 One-Post Bolt Plate, #SAQHD50BP-1, includes (4) pieces per kit, 7" x 7" x 1/2" (178x178x12.7mm). Two-Post Bolt Plate, #SAQHD50BP-2, includes (2) pieces per kit, 7" x 12" x 1/2" (178x305x12.7mm). 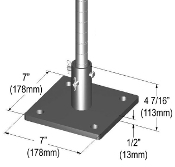 Four-Post Bolt Plate, #SAQHD50BP-4, includes (1) piece per kit, 12" x 12" x 1/2" (305x305x12.7mm).